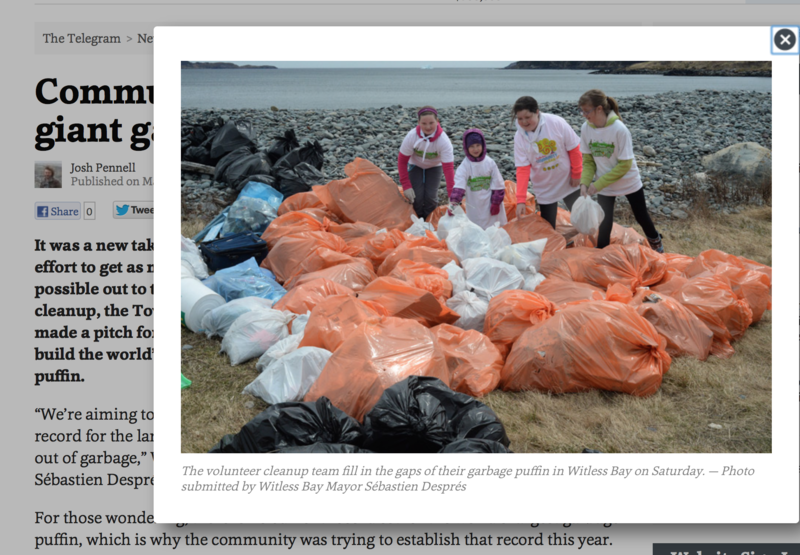 This year’s cleanup was a smashing success! 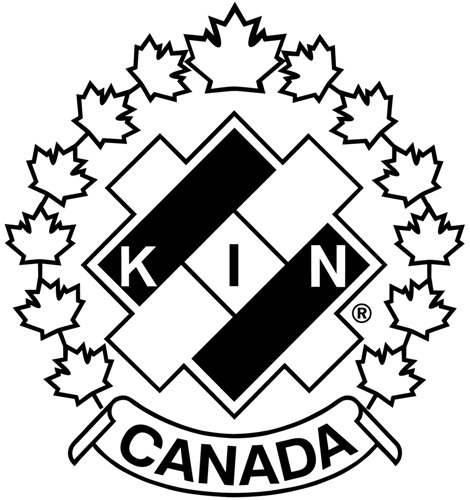 We had a GREAT turnout for the Kinsmen Community Cleanup this year! 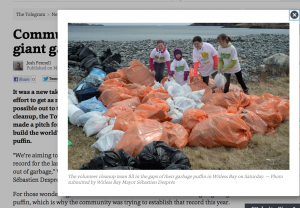 We definitely did establish the World Record for the largest puffin ever made out of garbage – it was made up of 242 bags of garbage, weighing in at FIVE THOUSAND SIX HUNDRED AND THIRTY-TWO POUNDS!!! 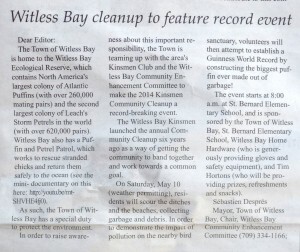 Thank you to the 75 people who joined the Kinsmen, the Girl Guides, the Town Council, St.Bernard’s Elementary, and the Witless Bay Community Enhancement Committee to make our cleanup a FANTASTIC success! It’s a beautiful thing to see so many of our community groups working together! A special thanks goes to the businesses that pitched in to help out: Eastern Waste Management, Witless Bay Home Hardware, Felix’s & Tim Hortons! I’ll be working on getting our achievement officially recognized by Guinness in the next months. 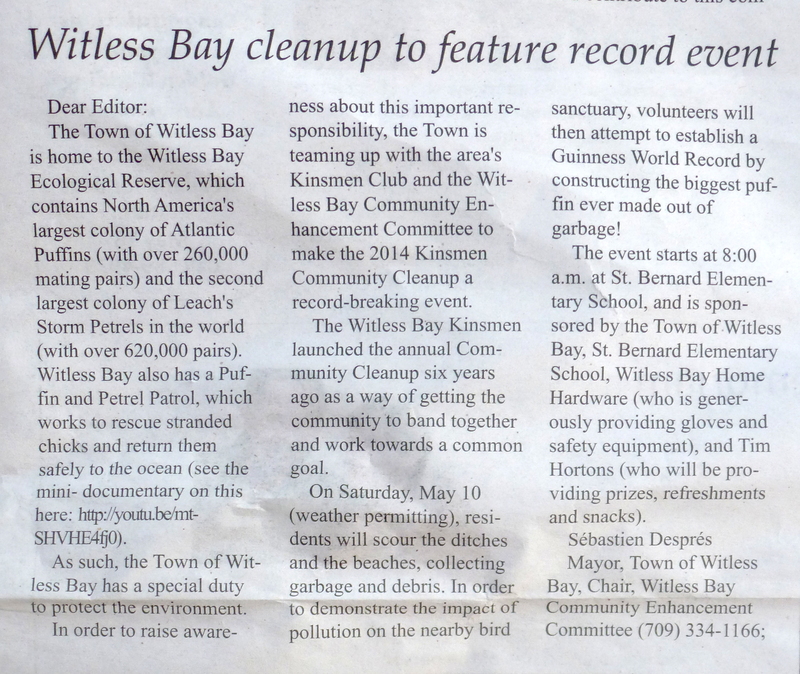 We managed to attract quite a bit of media attention leading to the event, and a TON of media following our cleanup! Click HERE for the video & to read the full story (in French)! Click HERE for the video of the interview & to read the full story! Click HERE to see the CBC’s Facebook post & audience comments – well over 100 shares!!! The recipe we used for 2014 worked very well. 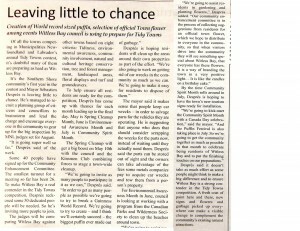 For 2015, it seems clear that we need to attempt making the cleanup into a regional event, involving the Town of Bay Bulls and the Local Service Districts to the south. We could then break our own record! This event is weather dependent. If postponed, it would take place on Sunday. If postponed again, it would be on the following Saturday. Advertising is important to ensure that the event is a success. In order to ensure great coverage in the media, great pictures are important. 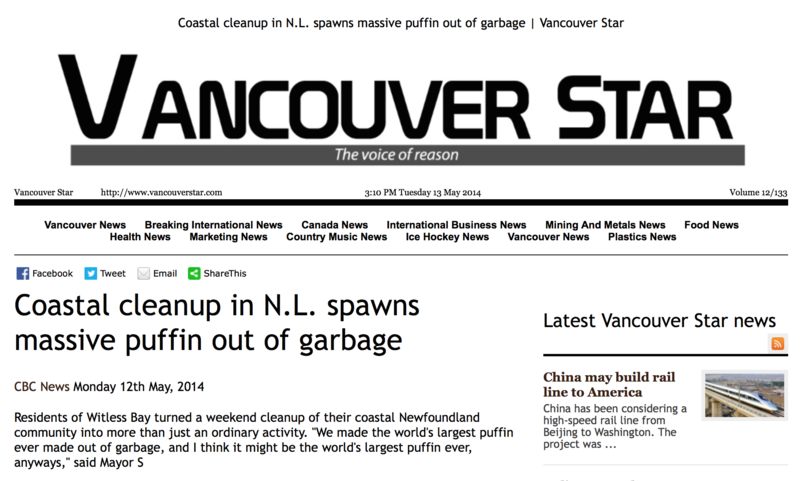 We must plan to have volunteers pose with “The biggest puffin ever made out of garbage ,” and ensure that sponsors’ logos are clearly visible in the image. o Mobile High School & St. Benard’s Elementary Students. o Town Website; Mayor’s Website; Mayor’s Facebook Page. o Facebook event and sharing campaign. o Posters at convenience stores, Post Office, Town Council. o Possible badge for Pathfinders? 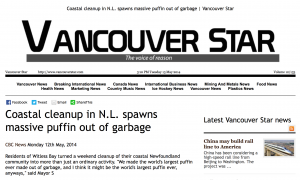 As in 2014, Council will attempt to arrange the final garbage pickup with Eastern Waste Management. 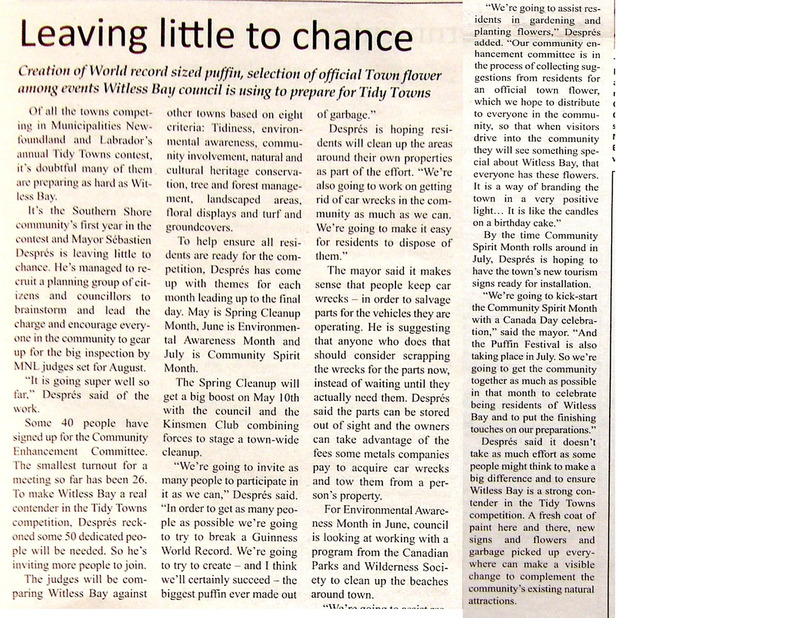 Should this not be feasible, perhaps Pierce Brennan (of Brennan Property Services) will again accept to ensure that if arrangements cannot be made with EWM, he could bring the garbage to Robin Hood Bay at his cost (thank you, Mr. Brennan, for making yourself available in 2014!). o Insurance arrangements will be made to allow for children to participate. Children under 12 years of age will need to be accompanied by an adult. o Gloves will be provided (Witless Bay Home Hardware sponsored the event and generously provided these on a number of occasions). o Volunteers should consider equipping themselves with grabbers or sticks with nails to pick up garbage in ditches. o Signage should be placed throughout the community to warn drivers. Sponsors’ names should be included on these. o Inviting the members of the Fire Department to participate would be very nice – perhaps distributing water bottles to volunteers. o A map could be made available with the number of people required for each section of the town. o We will be colour-coding the garbage collected to make recycling easier. o A few signs inviting residents and visitors to avoid littering should be posted around the community. These could feature a puffin caught in a 6-pack. o Even if they are unable to do the final pickup, Eastern Waste Management should be invited to participate in some ways. o MMSB could be contacted once again to see how they could partner with our cleanup.